With the rise of consciousness for healthy and nutritious diets, few winter veggie stuffed multigrain parathas cooked with minimal olive oil have become increasingly popular to be incorporated in any meal of the day. These parathas can also be made in a non-stick pan using no oil. Absolutely scrumptious and brilliantly healthy, these stuffed Indian breads can also be your full meal. Veg stuffed parathas are not only a popular breakfast item but they can also be served for lunch or dinner with yogurt, butter and pickle. The fresh vegetable stuffing gives out a nice flavour that blends well with the base of multigrain flour dough. The flour used to make these healthy parathas comprises of four ingredients – whole wheat flour (1 cup), soybean flour (1/3 cup), oats flour (1/3 cup) and gram flour (1/3 cup). Mix all four ingredients well and make a stiff and soft dough adding low-fat milk or water to it. Make the stuffing slightly spicy tangy, put more than a generous amount of stuffing to make parathas even tastier and healthier. It is a wonderful way to include healthy winter vegetables in your diet especially for kids who are not fond of most of the vegetables. These nutritious and delicious parathas are very attractive to look at and kids, adults and old people, all love eating them. Variations can be made by adding onion, garlic, ginger, different spices and herbs or paneer while preparing the stuffing. This way of incorporating winter vegetables in your daily diet speaks about health with palatability. Cauliflower paratha: Cauliflower is often referred to as the “King” of the Brassica family because it packs a lot of fiber and cancer-fighting nutrients. Like all vegetables cauliflower is a carb. But it is a non-starchy, complex kind with low amounts of natural sugar. It has only a trace amount of fat and is cholesterol-free. The nutritional profile of cauliflower paratha is quite impressive. It is high in fiber, good source of antioxidants, high in choline, rich in sulforaphane and may aid in weight-loss. It pulls cholesterol away from your heart and lowers it. In addition, it is a very good source of bone boosting vitamin K and immune-enhancing vitamin C. It is also an excellent source of folate, vitamin B6 and potassium. Cauliflower stuffing may help protect against diabetes. Pair them with some healthy accompaniments or low fat curd to make a healthful meal. One gobhi paratha has 218 calories that is about 11 percent of the total daily calories requirement of a standard adult diet of 2000 calories. Carrot paratha: Carrot paratha is rich in vitamins, minerals and fiber. Carrot is antioxidant rich and thus carrot paratha helps reduce the risk of cancer and cardiovascular disease. Being rich in vitamin A, it is beneficial for eyes. The antioxidants and phytochemicals in carrot paratha may help regulate blood sugar. This fiber-rich Indian delectable bread offers a good balance between potassium and sodium to protect against high blood pressure and heart disease. The vitamin C content may help boost the immune system and prevent many diseases. It is also good to promote healthy skin and slows down aging. This paratha serves as a great breakfast or lunch option as well as a great tiffin box preference. Serve it with butter, pickle and coriander chutney. Fenugreek leaves paratha: Methi paratha is a simple way to incorporate methi in your regular meals. It benefits in lowering blood sugar levels and inflammation. It boosts testosterone and increases milk production in breast feeding mothers. This paratha may also help in lowering cholesterol levels and control appetite. Methi paratha have a healthy nutritional profile containing a good amount of fiber and minerals, such as iron and magnesium. It has shown in reduction in fat intake. People with frequent heart burn found that these parathas reduced their symptoms. It also aids in digestion and may help provide wonderful skin and hair. Methi paratha goes well with any vegetable curry. Spinach paratha: Spinach paratha is an extremely nutrient-rich stuffed Indian bread. It contains high amount of carotenoids, vitamin C, vitamin K, folic acid, iron, calcium, potassium, magnesium and vitamin B6, B9 and E. Loaded with nutrients and antioxidants, eating spinach paratha may benefit eye health, reduce oxidative stress, help prevent cancer and reduce blood pressure levels. Most of the carbs in this paratha consist of fiber which may aid digestion and prevent constipation. Spinach paratha has beneficial effects on skin and hair and it also aids weight-loss. You will love the natural green colour of this paratha and of course the delicious earthy taste. Palak paratha tastes amazing with cheese spread or white butter. You can include some healthy greens in your diet by way of this natural green bread. Peas paratha: Peas or matar paratha offers a remarkable nutrition profile. It is a great source of vitamin K, manganese, thiamine, copper, vitamin C, phosphorus and folate. Green peas are a very filling food, mostly due to the high amount of protein and fiber they contain. They are also low in calories. Thus matar paratha helps in weight-loss. It aids in digestion and protects against some chronic diseases, such as heart disease and cancer. Being low in glycemic index, these parathas can play a significant role in sugar control. One green peas paratha gives 164 calories that is about 8 percent of the total calories of a standard adult diet of 2000 calories. Pair this paratha with a bowl of fresh low-fat yogurt for amazing taste and health. 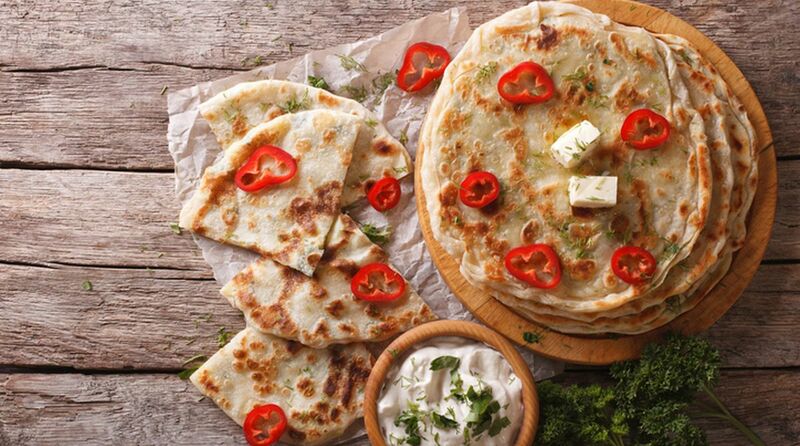 Vegetable stuffed parathas have been a part of Indian cuisine for hundreds of years. While authenticity of these parathas reeks in the stuffed versions, yet for the ease of making, you can make them as a mix that blends well with the flour dough along with spices. That is not only an easier way but delicious too. However the original technique of stuffed version is the quintessential one and it tastes tad more rich and appetizing too.